Christmas Wreaths At Arlington Cemetery-Truth! - Truth or Fiction? Christmas Wreaths At Arlington Cemetery-Truth! 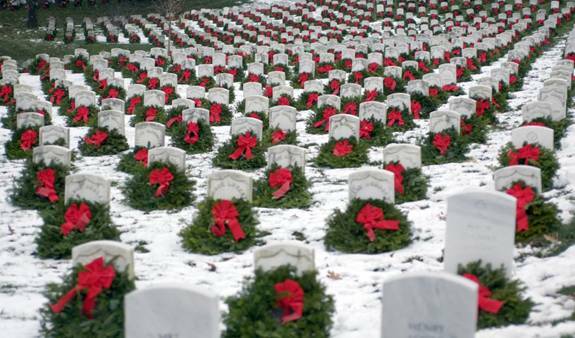 A picture of beautiful Christmas wreaths on graves at Arlington National Cemetery in Virginia. The wreaths have allegedly been donated since 1992 by Merrill Worcester of the Worcester wreath company. The picture and the story are true. His name is actually Morill Worcester (not Merrill). In 1992 he was faced with a surplus of wreaths and hearkened back to a memorable trip he’d taken to Arlington National Cemetery when he was 12-years old. He took the wreaths to Arlington from his business in Maine and laid them on the graves of 4,000 who are laid to rest there.